We’re here at the 80th Geneva Motor Show in Switzerland. Rather than wait for the show to open tomorrow morning we couldn’t resist a quick look at what is waiting for us. A brisk walk round the main halls made it quite clear that Peugeot means to steal the show with its SRI Sports Coupé dazzling in an ice time-tunnel with chrome waterwall and spaceship white stand. Here at YW, we are fascinated by all things automotive, but to bring you a total review of the Geneva Show, we’d have to field a massive team and bore the pants off you with endless pedestrian news and pix. So we’ll be bringing you the significant and milestone cars, but mostly the vehicles that turn our heads and really get our juices going. The new Mazda 5 people carrier, may look cool and suit your family fine, but we won’t go there. The Alfa Guilietta could equally well carry your kids and clutter, if not too numerous, but we will definitely delve in deeply with cameras and notepad. 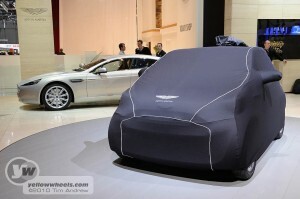 Baby Aston Martin will break cover tomorrow! If Frankfurt was the show of the electric car, Geneva is shaping up to be the hybrid show. Although not a new concept, there’s hardly a manufacturer not dipping their toes in the tepid water. This includes the specialist sportscar brands, with notably Ferrari, Porsche and Lotus taking the plunge. Those teetering by the edge wondering whether the whole idea makes sense, have had a shove in the back by both legislation and public perception of their green credentials. Fail to offer a hybrid, and you may be considered a technical stick in the mud. Whether this is good for the planet or not, remains to be seen, calculated, proven. But what was once just tinkering in the research departments has gone pandemic and into production. Talk to a designer/engineer and scepticism is the norm, with most favouring light weight, efficiency and energy recovery as greater means of reducing green house gases or going for straight all-electric drive. Fighting against this stream of hybrids, the Geneva show is trying to woo us with a host of natural/biogas powered cars. 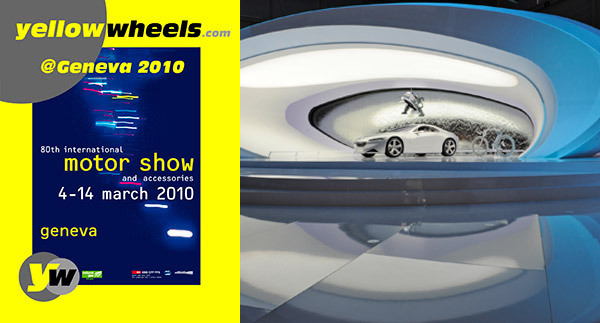 But, there’s a whole expo of cars to unwrap, so let’s not get bogged down yet in the green options and let the show begin!